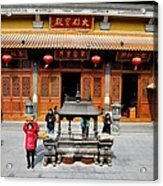 Worshipers In Urn Courtyard Of Chinese Temple Shanghai China by Imran Ahmed - 8.000" x 5.250"
Worshipers In Urn Courtyard Of Chinese Temple Shanghai China art print by Imran Ahmed. Our prints are produced on acid-free papers using archival inks to guarantee that they last a lifetime without fading or loss of color. All art prints include a 1" white border around the image to allow for future framing and matting, if desired. Thanks for the observation, Debbie. I did not notice the skew ... have yet to become an expert on a photo editing program. 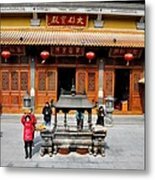 I am always happy to hear advice from others willing to share their expertise so please do share more observations / tips if relevant to my photo ... and thanks for taking the time to share. 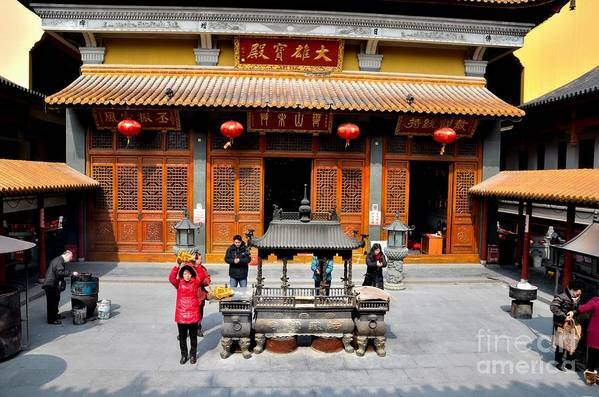 Shanghai, China - February 13, 2013: Worshipers make offerings and pray near an urn at a Chinese Taoist and Buddhist temple in Shanghai China. 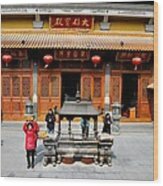 The rectangle urn for burning joss sticks is in the center. 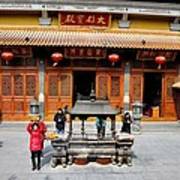 A blend of Taoism and Buddhism is widely practiced in China.